Some 50,000 teachers quit the profession last year – a record high. This left half of all schools starting this academic year with unfilled positions. Class sizes are rising with over half a million primary school pupils in classes of over 40 and 50. And with no requirement for opening academies where need is greatest, it will be harder to find sufficient good places everywhere. The schools budget has received a cut of 8% – the first real terms cut since the mid-1990s! So how can we justify spending money on a reorganisation? It’s not just me who thinks this is mad – senior MPs of all parties, teachers, schools, councils, along with over 140,000 petitioners have condemned the idea so far. 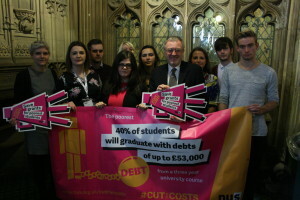 Yesterday I met with a number of student representatives to show my support for their opposition to the government’s student finance changes. The Tories have said they will be completely cutting the availability of maintenance grants to students, effective from September 2016. Laws under which Israel arrests and detains children in the Occupied Territories are different depending on whether a child is Palestinian or Israeli. That is inexcusable. It is just over four years since I wrote a Huffington Post article about Palestinian children in Israeli custody and the conditions to which they are subject to. As I said then, it is shocking when you hear about some of the things described, but worse when you see them for yourself and even worse for those who experience it. The sight of 13 year-olds in leg irons inside a high security prison will remain with me forever. So too will hearing testimonies of teenagers being driven for hours on end on the floors of Israeli prison vans – often without access to food, water or a toilet. Four years on, I should not have to write that these conditions have gone largely unchanged. That, however, is what I have to do. In the House of Commons this week, five years and one month after I and other MPs raised these issues in a similar debate in December 2010, my colleague Sarah Champion, Labour MP for Rotherham, again drew attention to Israel’s treatment of Palestinian child prisoners. As recent evidence published by Military Court Watch shows, children continue to be refused access to their parents or lawyers when interrogated. More worryingly, there are still regular reports of children who are hand-tied, blindfolded, physically abused, and even threatened with sexual abuse. Many of them have testified to being forced to sign documentation in Hebrew at the conclusion of an interrogation, despite having no understanding of the language. The 4th Geneva Convention forbids occupying powers from transferring prisoners out of their own countries to be imprisoned elsewhere. But Palestinian detainees continue to be transferred from Palestinian Territories to Israeli prisons in breach of international law. In June 2012, the Foreign and Commonwealth Office published a report produced by a delegation of 9 UK lawyers called ‘Children in Military Custody’. This found that Israel’s treatment of Palestinian child prisoners was in breach of Article 76 of the 4th Geneva Convention and several articles of the UN Convention on the Rights of the Child. Those teenagers I met who had been forced to spend hours on the floor of prison trucks, had been arrested in the West Bank but were imprisoned in Israel. A year later, in June 2013, the UN Committee on the Rights of the Child published a report calling on Israel to “dismantle the institutionalised system of detention and use of torture and ill-treatment of Palestinian children at all stages of the judicial procedure.” In February 2013, UNICEF also published a report outlining similar concerns. But this issue is not simply about ill treatment or even braches of international humanitarian law. It is also about institutionalised discrimination. Laws under which Israel arrests and detains children in the Occupied Territories are different depending on whether a child is Palestinian or Israeli. That is inexcusable. Israeli, Palestinian and international Human Rights organisations have raised these issues time after time. For years now, we have seen Parliamentary debates in the UK and elsewhere highlighting what is going on. In fairness to the UK Government, it has called on Israel to change the way it treats Palestinian child prisoners and detainees. Occasionally Israel promises to make changes but there is little impact on what happens in practice. So yes, the UK government should to continue to raise these matters with the Israeli Government. But it is time to do more than that. Those who collude with these practices need to be held to account. In the recent debate, Sarah Champion was right to call on the Government for a watch list of those who commit, aid, abet or procure others to commit actions against child detainees contrary to international law. If there is evidence against them, they should be prosecuted – whether they are resident in, or seek to enter, the UK. This is not about taking sides in the Israel/Palestine conflict. Neither is it about condoning law-breaking. If someone has committed a crime they should be arrested and brought to trial. The point is that this should be done without discrimination, respecting basic human rights and in line with international law, irrespective of nationality, religion or ethnicity. As a High Contracting Party to the Geneva Conventions, the UK has a responsibility to act to uphold these standards. The lights are up and anticipation is building for Christmas Day. And so I thought for my final article of the year it would be an apt time to be thankful and recognise the role of community in the area and the importance of standing up for Bournville College’s future. At the very heart of communities up and down the country are local schools and colleges. Bournville College is of course at the core of ours. And without Bournville, there would be no Community News! However its capacity to deliver as a college and community hub may be compromised as the Government has launched a review into Further Education (FE) or post-16 education in Birmingham and Solihull.